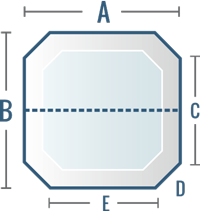 You have selected your spa shape as Square or Rectangle with Cut Corners. Now please input your measurements, choose your color and cover model to begin customizing your spa cover. If your spa has differing cut corners, please use the Eight-Sided Polygon shape. The dotted line represents the center hinge where the cover folds. Please double-check your measurements in relation to the fold orientation. Dimension B will be split in half by the fold. Bold fields are required. Please call us at (800)823-3618 if you have any questions. Save over 25% on your upgrades when you select one of our Spa Cover Upgrade Bundles. Custom-Made Spa Covers are currently taking 6-10 weeks for production.